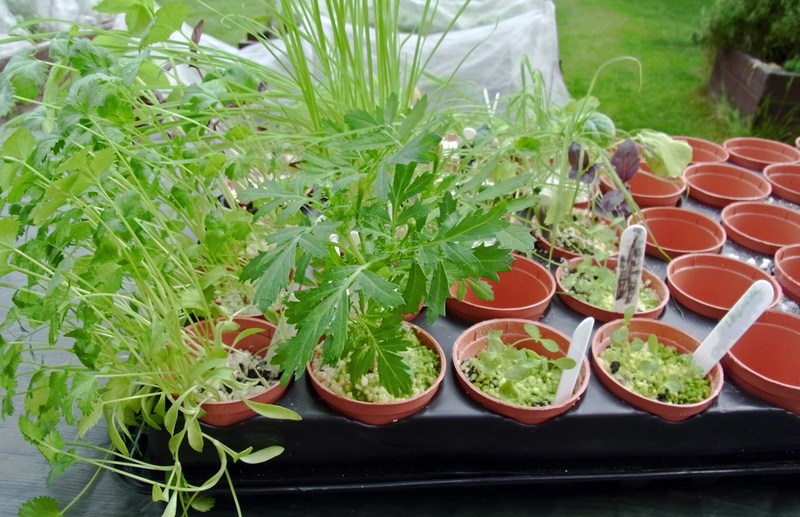 Priority One during this last week of high temperatures was potting on various things which were nearly bursting out of propagators, or which were outgrowing their initial small pots. 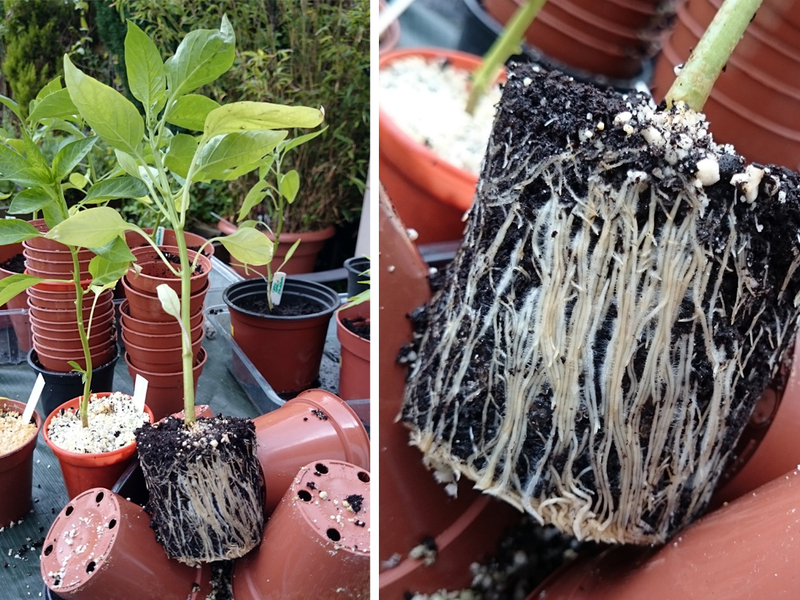 A whole load of chillis and sweet peppers were ready to move into bigger homes, evident from the mass of healthy white roots they’d formed. A while back I picked up a couple of unheated but large propagators from a discount store and have made good use of them, bringing on all sorts of seedlings after they’d germinated in the heated prop. Many of them moved house today: kale, marigolds, chamomile, basils green and purple, coriander, lavender, bunny tails and dill. In their new pots I topped the compost off with a layer of vermiculite – that amazing mineral which is so light the plastic bag weighs more than what’s in it. 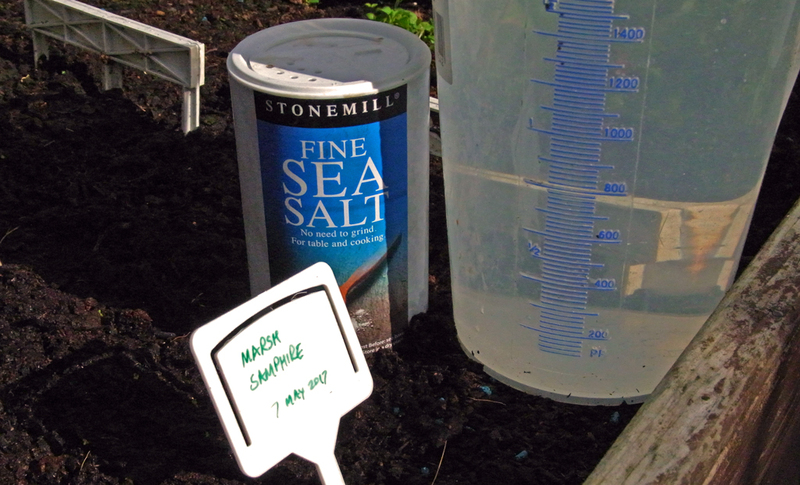 In this case it’s to reduce the risk of fungus gnats or similar pests getting into the compost. Now that the pots are in the mini greenhouses, they have a comrade in arms in the fearsome fork-leaved sundew, which makes a sticky end for any fly lured by its sweet succulent allure. Flies, schmies. 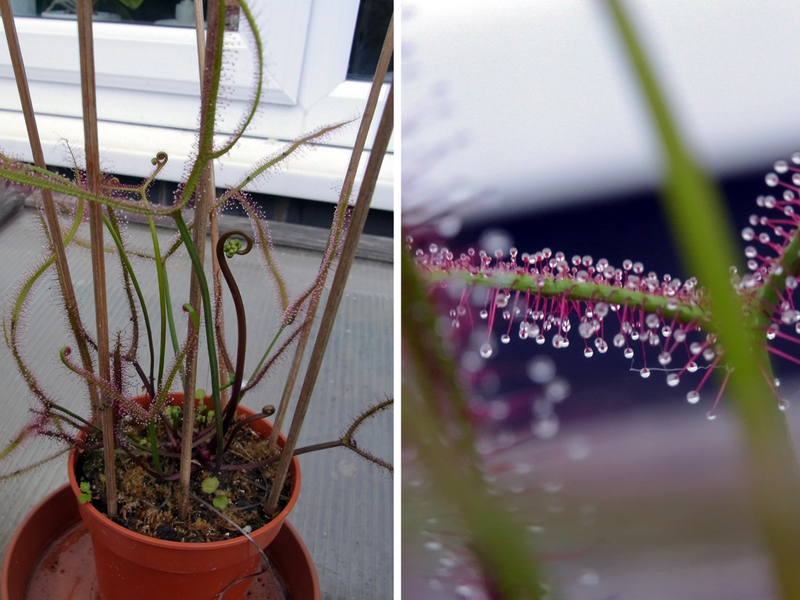 The ruthless Fork-leaved Sundew. The tomato plants are coming on reasonably well. I’ll plant them out in July but they’ll be in progressively larger pots until then. 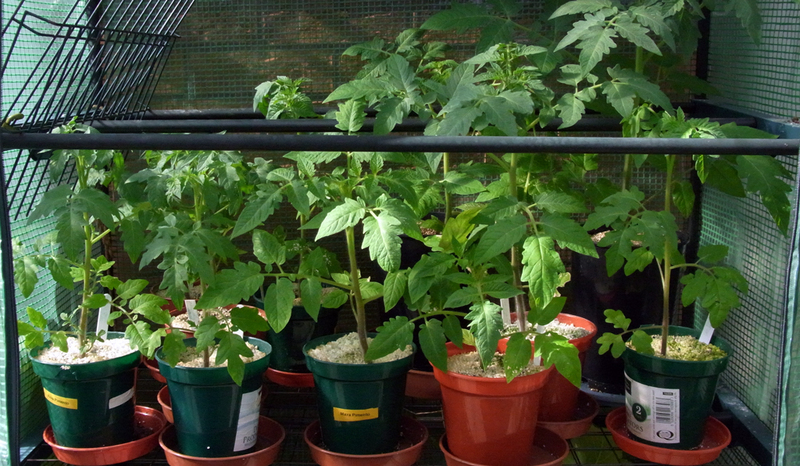 Of the four varieties I’m growing –Tomatoberry, Gardener’s Delight, Marmande and Roma – the latter two are fairly sprinting away, some showing their first flower buds. 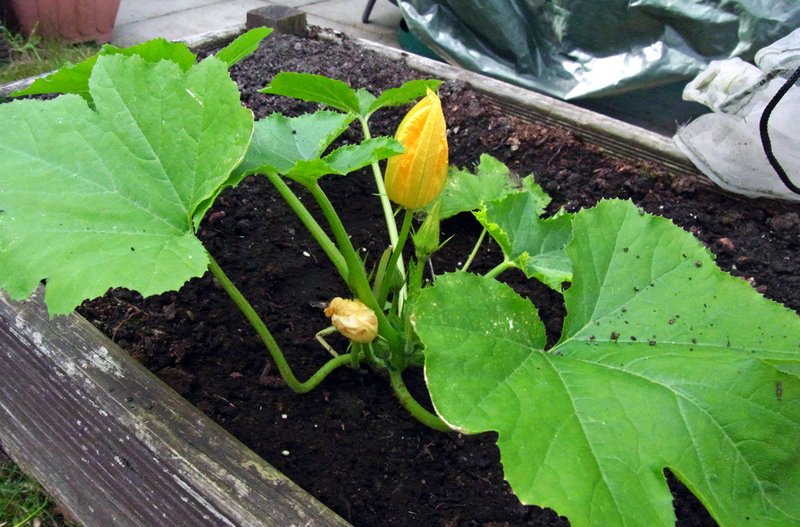 They can’t beat the courgettes though: the Tuscan plant has its first big yellow flowers about to open. If it was practical to have a musical interlude mid-blog post, at this point I would play Handel’s Hallelujah Chorus. All 3 minutes 47 seconds of it. And then I’d play it again. Why? I have samphire!! 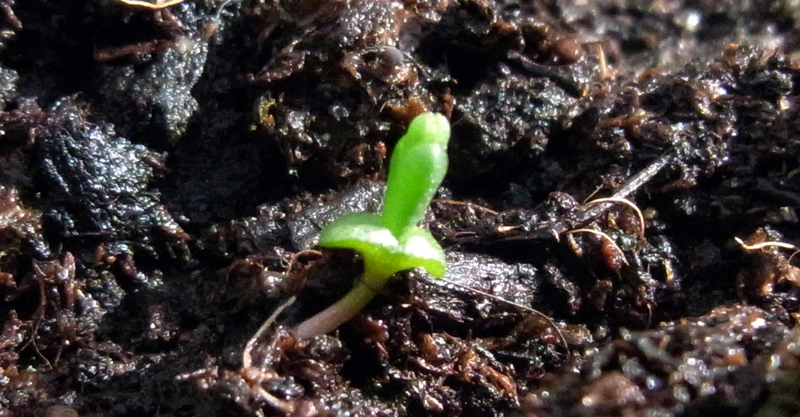 The elusive stranded delicacy which I’ve found so difficult to grow previously has revealed its first tiny shoots. They’re hardly bigger than the tip of a pencil, but the tell-tale fleur-de-lys shape is clearly there. Nearby, a triple row of about thirty Sutton broad bean plants is doing well as I only planted the seeds four weeks ago. 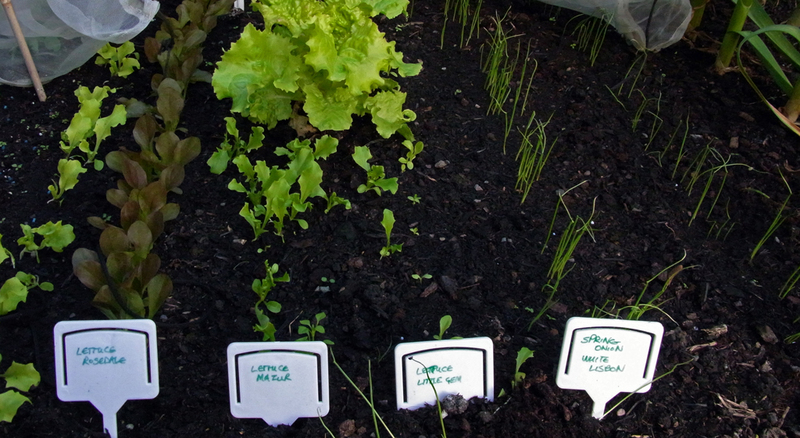 In the same timeframe, the different lettuces have started to grow, alongside spring onions and silverskin pickling onions. 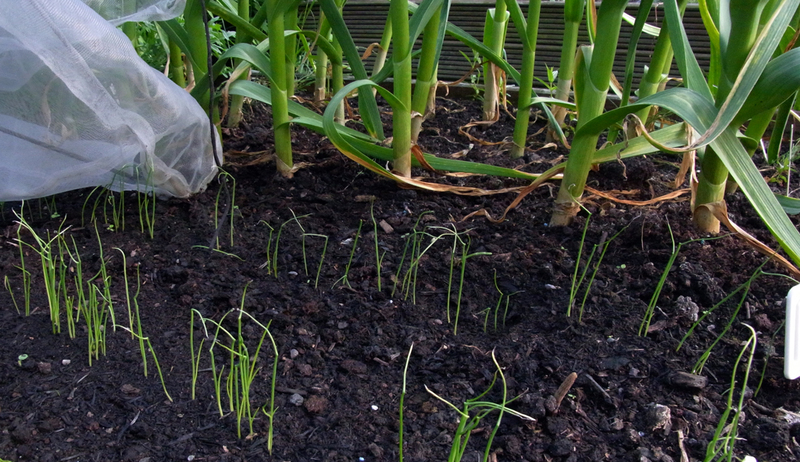 I like the way they’re overlooked by the comparatively huge garlic plants: a fellow allium showing the tiny seedlings the kind of heights they can aspire to. 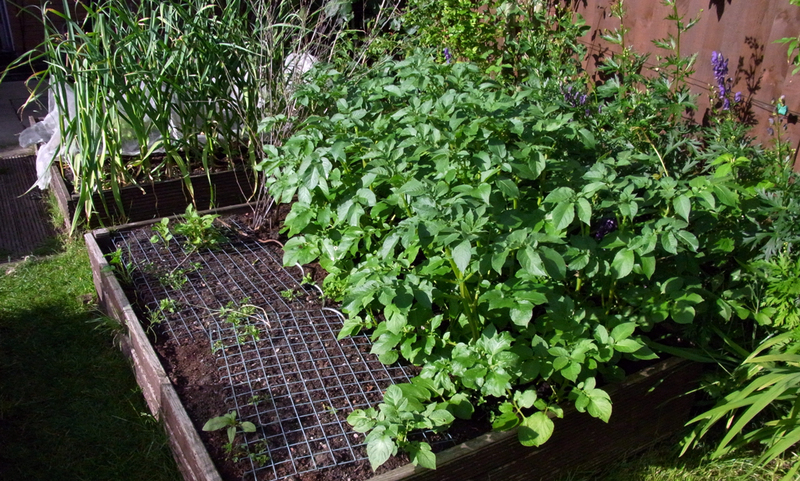 In the next bed along the Charlotte potato plants are growing very quickly. So quickly in fact that I can’t quite see a way of earthing them up to any useful extent. The bed is quite deep so there should still be a good crop, but with the haulms close to the surface I’ll need to be vigilant for any green potatoes come lifting time. Potato bed. The other half will take the tomato plants later. 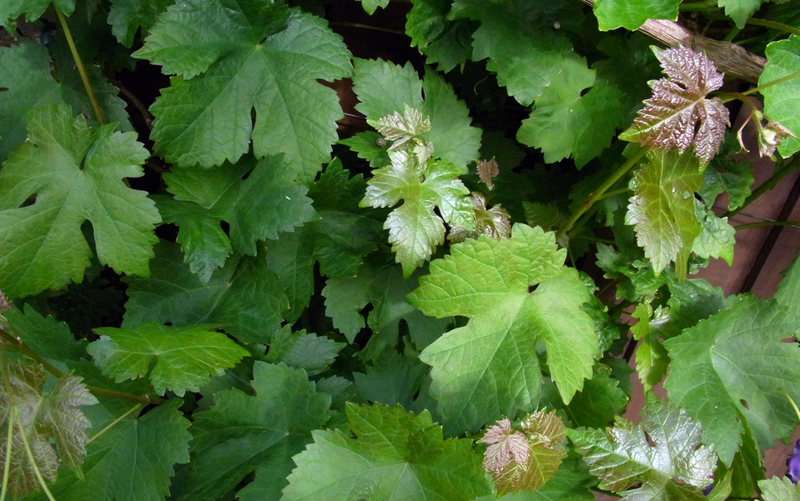 Along from the potato bed, the white grape vine is spreading nicely along the fence. There are tiny grapes forming but just as promising are the lovely vine leaves: I’ll be cutting off a good number of the young tender ones as the weeks go by and blanching and freezing them: they’re great for rolling around creamy rice mixes to make delicious Greek dolmades. A nice dessert I’d like to try with that is the Greek fig cakes called Sykomaitha, which are served on fig leaves. 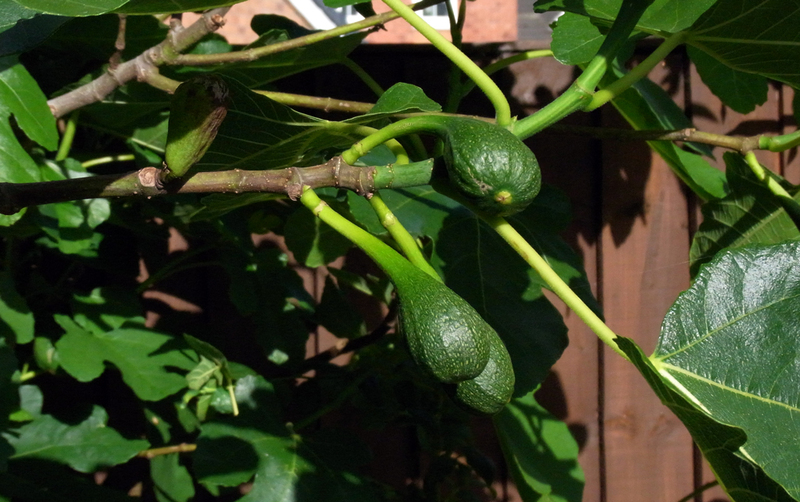 So it’s handy that the fig tree is doing well, with lots of fruit starting to plump up in the corner of the garden, still green for now but they’ll turn brown and yummy in a few weeks’ time. (Try kouzinacooking.com for a really good Greek food site). 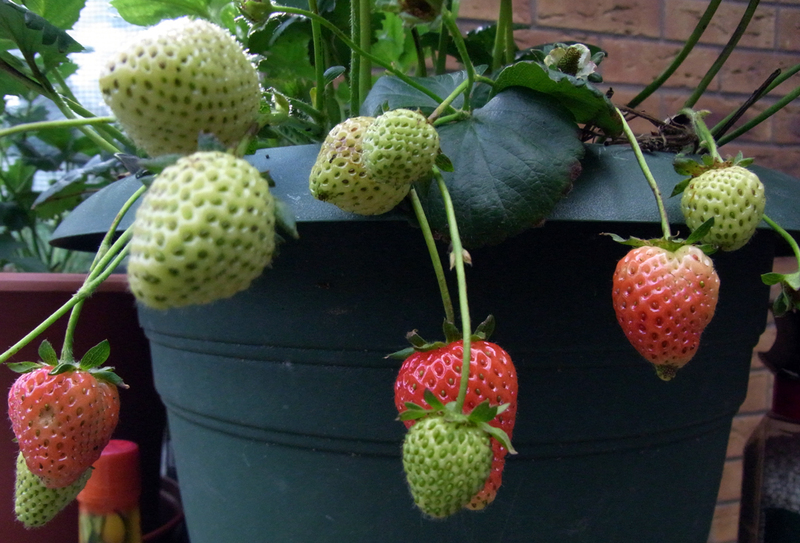 Before the figs are ready, the strawberries will turn nice and red and make for a special treat snack every time I walk past their pots. They say it’s going to be cooler and rainy in the new week. I don’t mind; the vegetables and fruits alike are all growing really well and they’ll cope just fine.